As Robert Blomfield, a former medical student in Edinburgh with a rich but relatively undiscovered line in street photography, arrives at his 80th birthday, this most unusual and welcome retrospective of a body of work which was formerly largely unknown offers a sense of Edinburgh-but-not-Edinburgh; a view upon the city which at once feels familiar, yet which offers landmarks and sights which are now gone. The accompanying blurb boldly compares his style to Henri Cartier-Bresson, although there are also strong echoes of the social photography of Nick Hedges, who documented tenement poverty in late 20th century Britain for Shelter. Blomfield's images are all presented in stark monochrome, and there's a sense of a simpler and most likely harder time about them, yet they're no poverty safari. The artist practised street photography in Edinburgh, Glasgow and London between the 1950s and the 1970s, and it's true that slum conditions were hard to avoid in every British city in those days (a particular kind of post-war decrepitude, that is, as opposed to the poverty of austerity which we find now). Yet these photographs capture a panoply of Edinburgh street life and work. His photograph of two women standing on a street corner, one staring angrily at the lens, as a pair of unplucked chickens lie at their feet, is destined to become a classic, as might the little boy earnestly motoring past a 'no vehicles please' sign on his toy tractor. Blomfield's children, whether in individual portraits or in a gang of lads on India Street, are bright-eyed and hopeful, his crooked older folk filled with character and with ruddy-etched stories written on their face. He has a way with finding just the right framing to pass wry or humorous comment upon what's occurring, and a real skill for beautiful moments of natural light cutting between buildings and through windows. From the university's lecture theatres to Leith pub doors, this show feels not only like an accurate document of the city's past, but like a well-observed and timeless study of people which is a joy to spend time with. 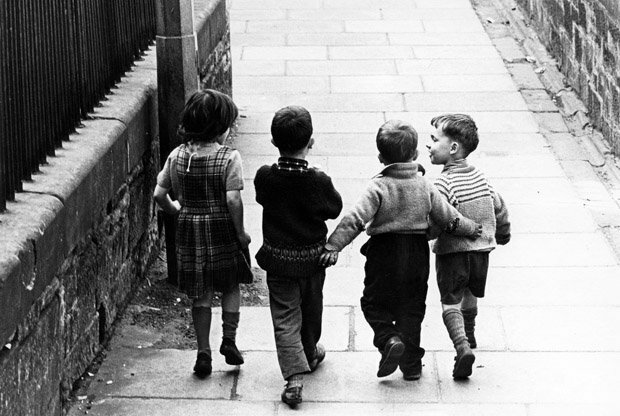 Robert Blomfield: Edinburgh Street Photography, City Art Centre, Edinburgh, until Sun 17 Mar. Exhibition of street photographer Robert Blomfield.